The Simpsons are being immortalized on a set of stamps issued by the United States Postal Service. The 44-cent first-class mail stamps, designed by Matt Groening, feature each of the Simpsons family members - Homer, Marge, Bart, Lisa and Maggie. 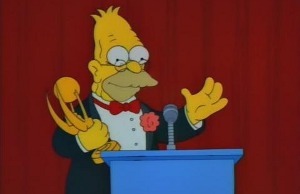 "This is the biggest and most adhesive honor The Simpsons has ever received," said Matt Groening. "We are emotionally moved by the Postal Service selecting us rather than making the lazy choice of someone who has benefited society," said executive producer James L. Brooks. The stamps will be released nationwide on May 7th. You can pre-order your set of stamps here. Homer headed for the Middle East? Homer Simpson could be the answer to world peace, according to the show's executive producer. Al Jean, who has helmed The Simpsons since 2001, said the dysfunctional cartoon family's next venture would be to the Middle East. The Simpsons visting a pub near you! To promote the upcoming Simpsons episode where the family visit Ireland, FOX is sending Marge Simpson look-a-likes into Irish pubs across New York, Los Angeles, Chicago, Boston and San Francisco on St. Patrick's Day, March 17th. They will also distribute 20,000 "Irish I Was Watching THE SIMPSONS" buttons as well as 50,000 drink coasters offering a free Irish Bart wallpaper and Homer ringtone for recipients' mobile phones. At Times Square in New York, a musical number from the new episode will be shown on Astrovision. In the Name of the Grandfather will for the first time air in Britain before America on Tuesday 17th March. It will air in the U.S. the following Sunday 22nd. The Simpsons renewed for two more Seasons! That's right, Fox has picked up The Simpsons for a further two years, taking the show though to Season 22. 44 episodes have been comissioned for the two series, meaning that the show will be close to breaking the big 500, with 493 episodes! The Simpsons will also break more records, notably beating Gunsmoke as the longest running show (in years) and overtaking several shows by number of episodes. However, it will still be behind Lassie and Gunsmoke in number of episodes, with those shows having 588 and 633 respectively. UK-based satellite channel Sky1 is to premiere a new episode of The Simpsons ahead of its U.S. airing for the first time ever! Guardian.co.uk states that the Irish-themed episode, In the Name of the Grandfather, will air on St. Patrick's Day (March 17th). Nancy Cartwright (voice of Bart), Al Jean and James L Brooks will travel to Ireland for a special screening of the episode. Starting from the next new episode on February 15th, Fox will begin airing The Simpsons in high-definition. It will also appear in a 16:9 (widescreen) aspect ratio. The opening titles will also be reanimated in HD, which could mean an entirely new opening sequence! Here's hoping they simply revamp it and not stray too far from the original sequence. 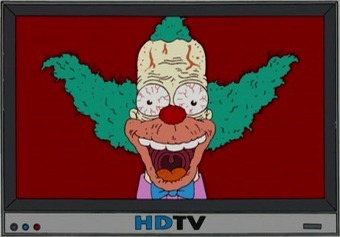 Hopefully The Simpsons won't look as bad as this in HD! The episode, entitled Take My Life, Please (LABF01), recalls how Homer lost the election for class president in high school. However, Homer soon learns that the election was rigged, and sees what his life would be like if he had won. Sci-Fi Wire, the online magazine for the popular Sci-Fi Channel, has just recently done a very interesting story about how the Simpsons do a lot of references toward Star Wars. They have compiled an actual Top 10 list of these references..."The Simpsons is stuffed with references to science fiction, including zillions of allusions to one of the most popular futuristic mythologies of all time: George Lucas' Star Wars. The Lucas universe has intersected with the Groening universe countless times, and we've picked 10 of the funniest instances for your parody-loving enjoyment." 10) Season Eighteen: "Revenge Is a Dish Best Served Three Times"
9) Season Eighteen: "Please Homer Don't Hammer 'Em"
8) Season Fifteen: "Co-Dependent's Day"
7) Season Twelve: "Worst Episode Ever"
The Simpsons is leading the charge for the Writers Guild of America's (WGA) annual broadcasting awards, with five nominations. The series was one of five nominees for best comedy series, along with Entourage, Weeds and previous winners 30 Rock and The Office. Four episodes of the show were also nominated separately in the best animation category. The WGA awards will given out at a ceremony in Los Angeles on 7 February. OK, we're pretty late on this, but if you caught the latest Simpsons episode a fortnight ago, Homer and Lisa Exchange Cross Words, you will have seen the special crossword in the New York Times that Homer 'commisioned' to prove his love for Lisa. 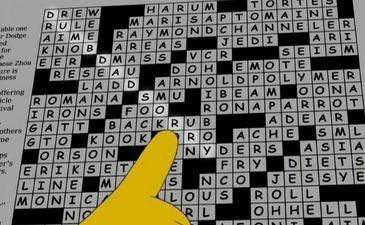 Well it's a real crossword that appeared in the paper the same day the episode aired! 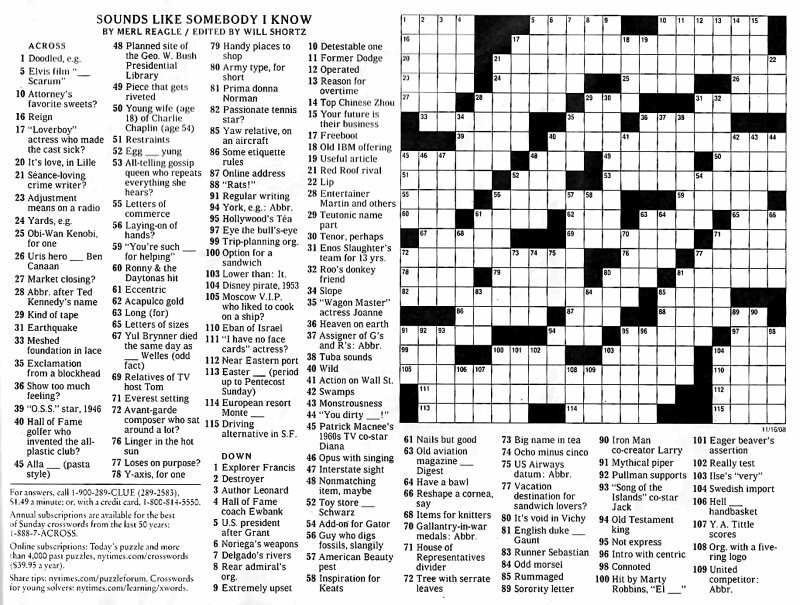 One of our readers Anthony Covino was kind enough to send us a scan of the real crossword, which you can see below. You can see the secret message by looking at the first letter of each clue. There's also a message in the diagonal of the completed crossword: "Dumb Dad sorry for his bet". Hallmark and its popular Keepsake Ornament line has released a brand new Simpsons ornament with sound. The ornament features Bart and Lisa sitting in from of the TV about to watch the Itchy & Scratchy show. When you press any of the buttoms on the TV the TV screen lights up and it plays the theme song to Itchy & Scratchy. The ornament, called TV Time, is only available at Hallmark stores for $20 and can be viewed online here. Long time no updates from me...been pretty busy the last few weeks. Anywho... the Season 16 page has been updated again with some more info on upcoming episodes. A promo card for the recent episode 'Sleeping With The Enemy' has also been added to the gallery. Not all great episodes, but worth watching, of course. Finally, the contests have been updated. The last one went unupdated for over a month, hopefully this time it will be updated more quickly. Season 16 starts this Sunday in the US, with the annual Treehouse of Horror episode...the fifteenth, in fact. And there's some nice-sounding episodes coming up too! Check out the Episode Guide where we've added a new Season 16 page. We will try and keep this updated as the Season progresses. And don't forget to go to the members section after a new episode airs to share your thoughts and to rate the episode! Along the same lines I have added promotional images for two upcoming episodes: one for Treehouse of Horror XV and three from All's Fair In Oven War. I have added some cool audio clips to the members section, from Inside The Actors Studio: The Simpsons. I have also reorganised the main page of the section, since it looked a little confusing before. If you have not rated many episodes, now is your chance! The more ratings we have, the more accurate the list will be, and it only takes two minutes to do. Along the same 'interactive' route, the contests are updated again. The previous answers were Homer: Bad Man for the Secret Sound and Lord Thistlewick Flanders for Which Character. New Contest here at Simpson Crazy! Ooh, this is a goodun! To start, we have a brand new, never-before-seen contest here at Simpson Crazy: Secret Sound. What you have to do is download a small sound bite, listen to it and say what episode it comes from. This contest replaces the Guess The Episode contest, but the Which Character? contest is still on-going. The marking of the contests is now semi-automatic - I check each and every submission, but instead of having to copy-paste names onto the scoreboard or find names and move them, it's all done automatically. You must provide an email address for validation purposes, but don't worry, it won't be displayed anywhere on the site. Because of the changes, the scoreboards have been reset (you can view the old scoreboard here). Go to the interactive page for more details and to play. Have fun! A new script for The Springfield Files has been added, and there's more on the way soon. We also have four new pictures in the gallery, which can be seen by clicking the "More/Comment" link below. Finally, there are two new wallpapers in the gallery, and I have modified another one (I wasn't totally happy with it). I also want to highlight a couple of others which were added with the merger but not posted, because I really like them (the Homer/Maggie one is on my desktop right now). Click "More/Comment" for details.